Presenters at the meeeting who are logged in with a special account may upload .pdf, .doc, .docx, .ppt, and .pptx files here. 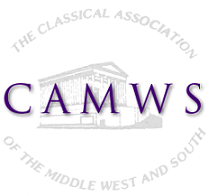 If you are a presenter who would like to upload files, please contact camws@camws.org for instructions. In the box labeled "Description" please type your name and the title of your presentation as it appears in the program. You can also rename the file you are uploading and are asked to shorten very long file names and to use unique names (not generic ones like "CAMWS2019" or "CAMWSpaper"). Scroll down below the list of uploaded files to upload yours. It is helpful if you place your last name first, and the title in quotation marks, so that the sorting of the "Description" field makes sense: for example, Smith, Prof. John, "Homer and Herodotus." Please note that these files will remain posted on this webpage indefinitely and that any visitor to this page may download materials linked on this page by right clicking (Ctrl + click on a Mac) on the file name and selecting 'Save As...'. Accessit Latinitas handout.pdf Sophia Decker- "Accessit Latinitas: Urbanite Hymnody in the Context of Renaissance Classicism"
AdkinsEvelyn_CAMWS2019_ApuleiusApology.pdf Adkins, Evelyn, "Rhetorical Sleight-of-Hand in Apuleius' Apology"
Ager- Roman Witches and Orpheus.docx Britta Ager, "Roman Witches and Orpheus"
Bolig_Nicholas Handout.pdf Bolig, N. "We Might Need Prophets Here: An Examination of Divinatory Perspectives in Aeschylus’ Oresteia." Bungard - Innovative Technologies.pdf Bungard - Roundtable, "Innovative Technologies in the Latin and Greek Classroom"
Burmeister Torie Idyll 2 Mulholland Drive.pdf Opening the Box: Narratives of Fantasy, Desire, and Marginalized Women in Idyll 2 and Mulholland Drive. Caldis_Hadrian_Succession_Handout.pdf Sam Caldis, "Reading History Forward: Marcus Aurelius, Lucius Verus, and the Will of Hadrian"
CAMWS 2019 - Cato Age of Augustus HO.docx Mark Thorne, "Victus Victor: Remembering Cato Uticensis in the Age of Augustus"
ConnerGiantsofthePast.pdf Daniel Conner, "Giants of the Past: Compressive History in the Duel of Scipio and Crixus in Punica 4"
Correa CAMWS2019 Handout.docx Jonathan F. Correa – "Virtue of Agency or Agency of Virtue: Political Fantasy in the Historia Apollonii regis Tyri"
DeLozier_Plus_Quam_Amabile_Handout.pdf Laura De Lozier, "Plus quam amabile: the Boy Who Wept at Public Executions." DuBois - Theocritean Hermaphroditus.pdf Shannon DuBois | "Theocritean Hermaphroditus: Ovid’s Protean Allusions in Met. 4.285-388"
Dugan - Henry Brown Handout.pdf Kelly P. Dugan - "Henry 'Box' Brown, Charles Stearns, and Classics as White Voice in the Freedom Narratives of Formerly Enslaved Black People in 19th-Century America"
Garcia Jr_Temporality Aphrodite.pdf Garcia Jr, Lorenzo F.
Goblirsch - handout - CAMWS 2019.docx Amie F. Goblirsch, "etiam periere ruinae: Touring the Ruins in Lucan’s Bellum Civile and Vergil’s Aeneid"
Hahn_Hesiod_Tripod.pdf Samuel Hahn, "Hesiod’s Tripod Rededicated: A Reinterpretation of WD 650-662"
Handout Hafner Robinsonade 2019.pdf Markus Hafner (LMU/UNC) - The isolated hero vs. the deserted heroine or Is there a Female Robinsonade in Ancient Literature? Hendricks HhD Handout CAMWS 2019.pdf Amy Hendricks, "Out to Play Before We Give Her Away: A Maiden Chorus in the Homeric Hymn to Demeter"
Hunt-Senecan Geography online handout-CAMWS 2019.pdf Charlotte Hunt. Online (expanded) handout for "From the Indus to the Araxes: Place Names and Geography in Seneca's Medea". Section D: Senecan Tragedy I.
Hunt-Senecan Geography PPT-CAMWS 2019.pdf Charlotte Hunt. Powerpoint for "From the Indus to the Araxes: Place Names and Geography in Seneca's Medea". Section D: Senecan Tragedy I.
Jendza, Comedy and Transgression in Aeschylus' Oresteia, Handout.pdf Craig Jendza. "Comedy and Transgression in Aeschylus' Oresteia." Johnson-CountingOutTimeHandout.docx Mason Johnson, "Counting Out Time: Senecan Stoicism and Human Temporality"
Kaloudis_Naomi_Theocritus.pdf Naomi Kaloudis, "Goddesses, Monsters, and Shepherds: Playing with Homeric Fantasy in Theocritus' Idylls"
KitchellHandout.pdf Latin Teacher Training: Does it Have a Future Tense? Kretler Handout Mark Odyssey.pdf Katherine Kretler, "The Syrophoenician Woman (Mark 7:24-30) and the Tradition of Enigma"
Latham - Iphigenia as Orpheus pdf.pdf Brooke Latham, "Iphigenia as Orpheus in Euripides' Iphigenia at Aulis"
Latham - Iphigenia as Orpheus.docx Brooke Latham, "Iphigenia as Orpheus in Euripides Iphigenia at Aulis"
Loney_Hopes and Prometheus Bound.docx Alexander Loney--"The Mortal Condition and 'Blind Hopes' in the Prometheus Bound"
Lu Mausoleum of Empire.pdf Ximing Lu. "Mausoleum of Empire". Lupu Julian's Platonopolis.docx Matthew Lupu | Julian's Platonopolis? McGraw Holy Statue.pdf Claire McGraw "Holy Statue: Dio Cassius and Agrippa's Pantheon"
Moorman Lying Eyes Apuleius.docx Rebecca Moorman, "Lying Eyes? Autopsy, Credibility, and the Senses in Apuleius, Met. 1.4"
Moss Statius II Harmonia handout.pdf Carina Moss, "The Chains that Bind: Statius, Harmonia's Necklace, and Elegiac Tropes"
Murderers and Tyrannicides handout.docx Kenneth Elliott, "Murderers and Tyrannicides: Slaying in Roman Law and Declamation"
Panoussi.pdf Vassiliki Panoussi, Technology and the Artist: Ovid’s Daedalus and Riordan’s "The Battle of the Labyrinth"
Preble_JasonHomonoia.pdf Preble, Kate, "Jason and Homonoia"
Samos Homeric Hymns.pdf Alexander Hall - "Ties that Bind: Samian Cult Connections in the Homeric Hymns"
Seidman Social Movements Syllabus.pdf Jessica Seidman, "Seeing Yourself in the Text:The Role of Reception in the First-Year Undergraduate Course"
SpearmanVergilsCavesUPDATED.docx UPDATED Handout listing Vergil's caves (and the cave of Macris in Apollonius of Rhodes' Argonautica). Strategies of Dishonesty in Homer's Odyssey.pdf Hilary Bouxsein, "Does Repetition Make it True? Strategies of (Dis-)Honesty in Homer's Odyssey"
Swist - Servius Tullius Imperial Nachleben.pdf Jeremy J. Swist, "Servius Tullius' Imperial Nachleben"
The Problematic Nature of Philia-handout.pdf Olayiwola Ologbonde, "The Problematic Nature of Philia in the Samia: A Comparative Study of Aristotle and Menander." Theodore Nash - Euripides' Heraclidae.pdf Theodore Nash - Euripides' Heraclidae, CAMWS 2019. Uhl - Crudelis Gloria.pdf Chad Uhl, "Crudelis Gloria: Casting the Nemean Serpent as the Genius Loci in Thebaid 5." Van de Loo From Cicero to Augustine Handout.pdf Van de Loo, Kathryn S. "From Cicero to Augustine: Three Styles in Augustine's Enarrationes in Psalmos 69"
Volvere Casus _ van der Horst.pdf Rebecca van der Horst - "Volvere Casus: The Aeneid and Volvo"
Walker — Oligarchy and Tyrants.pdf Henry John Walker. "The Old Roman Senate and the Young Tyrant Nero." Wells Wisdom Poetry Planetary Gardening.pdf James Bradley Wells | "Ancient Mediterranean Wisdom Poetry, Traditional Ecological Knowledge, and Planetary Gardening"